Bible Cartoons: Zephaniah goes green by The Great Day of the Lord! Zephaniah goes green by The Great Day of the Lord! I have just completed my latest Bible Cartoon, based on the Old Testament “minor prophet” Zephaniah. I was struck by verse 14-18 in the first chapter, which is a description of The Great Day of the Lord, or Judgement Day. As I read these apocalyptic verses, I was reminded of a desire I’ve had for some years to draw a homage to a 19th Century Romantic painter named John Martin. He painted a triptych (3 paintings intended to be viewed together) of the Last Judgement & I saw this as my opportunity to render a similar Bible Cartoon, with my usual figures woven into the picture’s narrative. I started this scene by creating a pen & ink drawing of the major elements, & proceeded to colour up, using John Martin’s painting as a reference for colour & tonality. My version retains the black ink keyline (outline) around the major elements of the picture which characterises my work & is a deliberate design choice. Obviously John Martin’s painting doesn’t use that “cartoony” feature; he was a much subtler & greater artist than I am! Another major difference between our works is the inclusion in my own of the large foreground figures. In Martin’s own work the figures are very small & unobtrusive, whereas mine are large & bold! I am principally interested in creating a Bible cartoon, rather than a landscape picture, so the inclusion of large figures is a deliberate design decision as well. I have deliberately used colours for skin tones & clothing from the background, so that even though the figures are large, they won’t unbalance the composition & protrude too much into the viewer’s focus. If I’d used contrasting colours (blues & greens) then they would stuck out like a sore thumb! I estimate it might have taken John Martin a year to complete his work. According to the Tate Britain the dates for the complete triptych are 1851–3, which would equate to about 1 year for each of the 3 paintings. I have taken 2 days to produce this scene on my computer – how amazing modern technology is! The more I looked at “The Great Day of His Wrath”, s I reproduced the work, the more I found to see: tiny details & passages of colour that I hadn’t noticed before – no wonder it took so long to paint! I took the decision to greatly simplify my version, or else it might have taken me a year to complete as well! I am pleased with the version I have been able to produce, & a wonderful benefit of looking so closely at Martin’s original (in order to reproduce it) is an increased awareness of the breathtaking drama & subtlety of his work. Biblical emphasis in my picture. 02) “a day of trouble and ruin, a day of darkness and gloom, a day of clouds and blackness,” these are all reflected in the background scene of the mighty earthquake, with lightning & the central, darkened, blood-coloured sun. 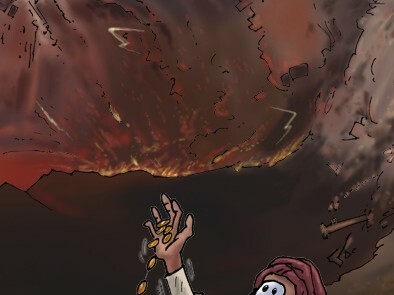 03) Verse 17 reads “I will bring distress on the people and they will walk like blind men, because they have sinned against the Lord.” This is reflected in the woman in the foreground of my scene, who has arms outstretched, as though blind. 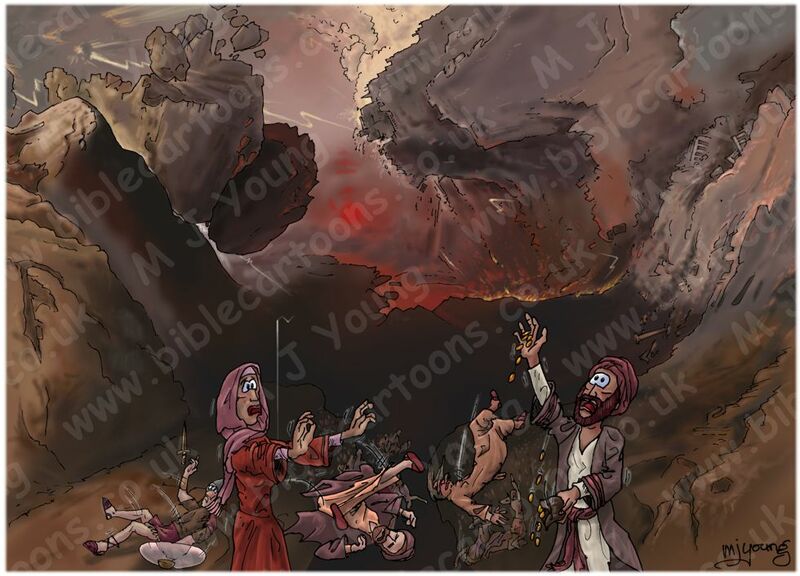 04) Verse 18 reads “Neither their silver nor their gold will be able to save them on the day of the Lord’s wrath.” Notice the man in the right foreground, who is offering up gold coins towards God (presumed to be in the sky by this man!) But his money is falling from his hands & will go down into the abyss with him. This last point is important to consider, especially for us in the affluent west, where we think money can buy anything. The fact is, on the day God judges the whole Earth, it won’t matter how much money you’ve got! Cash won’t “cut it” on Judgement Day, because money is the wrong kind of “currency”! What is needed is belief in & acceptance of, the Lordship of Jesus the Christ in your life. The Judgement will be to divide those people who have accepted Jesus as their personal Saviour, & those people who have rejected Christ, which will be shown by their life & lifestyle. Money, possessions, status, fame, & all else won’t matter 1 little bit on Judgement Day. All the things which we consider as valuable & desirable simple won’t matter at all on that day. As Matthew Henry (the Bible Commentator) said, “Zephaniah intended not to frighten them [the Hebrew people] out of their wits, but to frighten them out of their sins.” – Good point, & just as valid to us in the 21st Century as it was to the people in Zephaniah’s day! the shouting of the warrior there. and their entrails like filth. on the day of the Lord’s wrath. As I pointed out earlier, for many years I have admired John Martin’s oil paintings. In fact his work first came to my attention in an Art History lesson, whilst I was doing an Art Foundation course at Nene College (University of Nothampton now) in 1987-8. 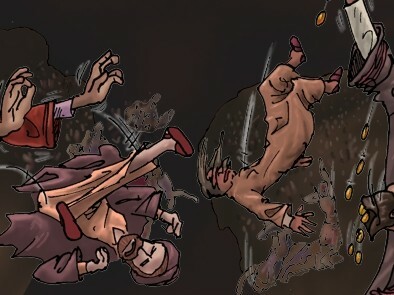 My picture is a little homage to his “The Great Day of His Wrath”. English Romantic painter and mezzotint engraver, born in Northumberland. Very popular in his own lifetime for dramatic scenes of cataclysmic (often Biblical) events crowded with tiny figures placed in vast architectural or landscape settings. John Martin’s “The Great Day of His Wrath” is an oil on canvas painting from 1853. Measuring 77.36 × 136.6 inches (6.44 × 11.3 feet) or 1965 × 3470 mm (1.9 × 3.47 metres) it is a stunning & thought-provoking scene. 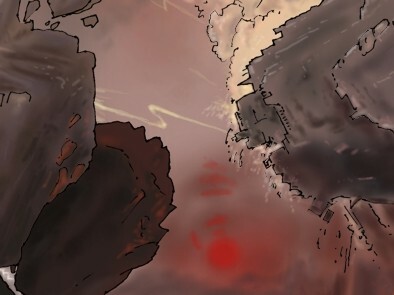 “The Great Day of His Wrath” shows an entire city being torn up and thrown into the abyss. Along with 2 other paintings (“The Last Judgement” and “The Plains of Heaven”) it forms a vast triptych, the Judgement Series. Inspired by the Book of Revelation (see quote below ), the paintings were originally to be “read” (from left to right) as follows: “The Plains of Heaven” (depicting the elect/chosen), “The Last Judgement” (the central painting, showing the Lord God, Satan’s downfall, & 2 groups of people, the elect/chosen on the left & the condemned on the right), with “The Great Day of His Wrath” on the right of the other two paintings, showing the condemned falling into the abyss of Hell. In “The Great Day of His Wrath”, Martin depicted the damned falling into the abyss, including richly dressed women, notably Salome daughter of Herodias, and the whore of Babylon, and also lawyers and clergymen, including a bishop and a pope. A railway train with carriages labelled “London” and “Paris” tumbles into the bottomless pit. The forces of Satan are being defeated, with the armies of Gog and Magog also falling into the abyss. I have seen all 3 of these paintings whilst on an Art History field trip (1987-8), in the Tate Britain gallery, London. I stood before them for quite a while, admiring their complexity & drama, although, at the time, I didn’t know they should be viewed together as one vast triptych scene. 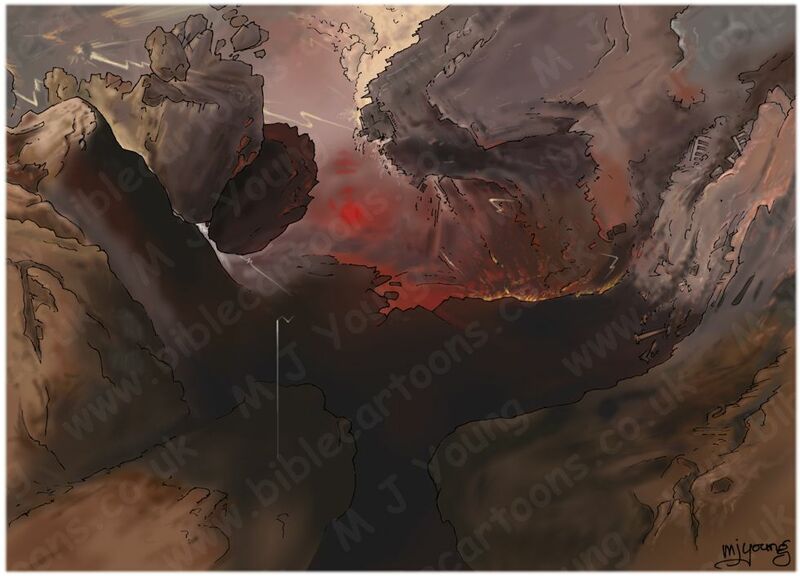 That comment of John Martin’s, about receiving remuneration for his labours, is one of the reasons I make Bible Cartoons available on this website… it appears I am in good company! 12 And I beheld when he [the Lamb of God] had opened the sixth seal, and, lo, there was a great earthquake; and the sun became black as sackcloth of hair, and the moon became as blood; 13 And the stars of heaven fell unto the earth, even as a fig tree casteth her untimely figs, when she is shaken of a mighty wind. 14 And the heaven departed as a scroll when it is rolled together; and every mountain and island were moved out of their places.